Is there anything more exciting than the onset of knitwear season? This free chunky hat knitting pattern is keeping Angie nice and warm this week. There’s nothing I love more than crisp November mornings, when winter is just starting to creep in. I love seeing the frosty leaves on my way to the train station in the morning, as I walk past the horse pens and the ducks in the river. Now that those crisp mornings are starting to turn into crisp days and cold nights, I wanted to make a fun and funky hat that you could whip up in less than a day. I love stripes, I love pompoms, and more than anything else, I love alpaca. I love alpaca. I also adore chainette construction yarns, because they are very stretchy and have loads of give in them. I chose to use Debbie Bliss Paloma in Silver, Soft Green, Jade, and Mallard. This super chunky yarn is absolutely to die for – I’ve used it before and I’m in love with it! You’ll need one ball of each shade for this hat, and you’ll have enough left to make a couple pairs of gloves or another small hat. Parent and child matching hats, anyone? And if you’re more of a minimalist, you could easily use only 2 colors – one ball of each would be plenty for one hat. Keep in mind that this yarn comes in a loose hank, and you’ll have to wind it into balls – but don’t wind too tight! The chainette constructions means this yarn is stretchy, and you don’t want to stretch it out before you knit it into a gorgeous hat. This pattern is super simple. You’ll need some US 15 (10 mm) circular needles with a short cord length. I chose my trusty Addi bamboo circulars for this project – the bamboo is a good choice for slippery yarns. This hat is knit in the round, but if you’ve never tried it before, this is a great opportunity to start! This hat fits an average sized adult head. Note: You can stripe however you wish, you’ll have plenty of yarn! Cast on 50 stitches and join to work in the round, being careful not to twist. Place marker to mark the start of the round. Work in a k2, p2 rib for 3 inches, enough for a generous brim to roll up if you so desire. On the next round, knit all the way to the end of the round. Continue in this manner until hour hat measures 10.5 inches from the cast on edge. Pull yarn through the remaining stitches, pull tight, and sew in ends. I chose to make 2 pompoms, because I love any excuse to make a pompom – but this hat would look equally fabulous with one. Use whatever method you choose for pompom making – I recommend the Pony pompom maker for super simple pompom making. 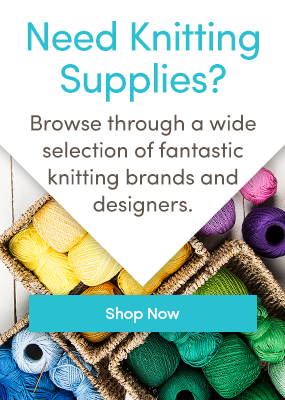 Love free patterns? Follow us on Bloglovin’ and never miss a post! I would make a waistcoat. i copy and paste the text of the pattern only into word/pages and print from that. bit of a faff but it works. You’re right! I’ll work on making these posts with an optional pdf download. Thanks for the feedback, and happy knitting! Has anyone tried the split ring Pony Pom Pom Maker? Wondering if it has advantages over the full-ring one shown in the link above. Hi Anteateralice! I’ve used both pompom makers, and it just depends on your preference. I prefer the full ring one because I am a clumsy sort and I’ve messed up a few poms using split ring makers in the past. If you prefer a split ring, I say go for it! Happy knitting!